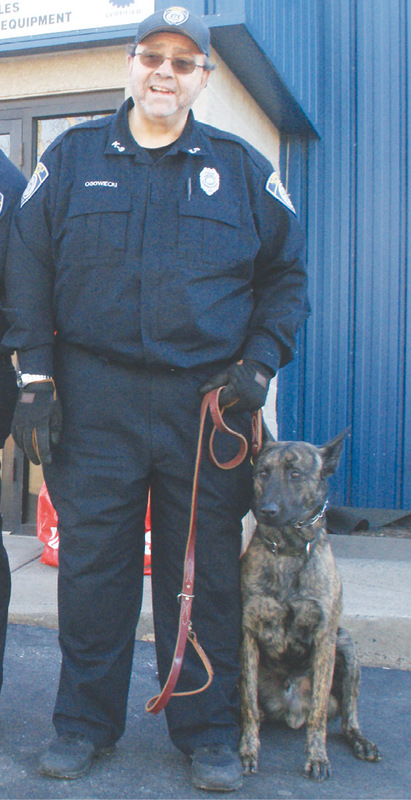 Officer Peter Osowiecki is pictured in December 2017 with his K-9 partner Tazz. Officer Peter Osowiecki has retired from the Suffield police force, but he has not retired from duty—not at all. On the contrary, his career has morphed into a new phase. Now he has the time and energy to pursue his greatest passion, which is the training of police dogs for the K-Nine Corps, something he has been doing here in Suffield, and also on a larger scale, since 2005. At the moment he has three highly trained dogs that serve the Suffield police but live at Osowiecki’s home. Officer Osowiecki is certified by the North American Police Work Dog Association as a master trainer, one qualified to teach others this important skill. He leads workshops around the country and certifies both trained dogs and other trainers. In his own career as a police officer, he has focused the training of his own dogs on narcotics searches, but police dogs are also used for other purposes, such as search and rescue activities. Police dogs are not pets, but are carefully chosen for their drive and trainability. Officer Ososwiecki prefers three breeds for his work: German shepherds, Dutch shepherds, and Belgian Malinois. The training of each dog requires about 12 weeks, and is exceedingly intense. Osowiecki’s headquarters for training sessions are in Windsor Locks, on the second floor of a warehouse building, where there is plenty of space for his needs. The space is divided into larger and smaller rooms, and each area is set up to resemble a site the dogs might have to enter. There are areas where noises can be made, or flashing lights, or unusual materials which would normally frighten a dog. One area has a wall of lockers, such as a school corridor might have and where dogs might be used for a search. Others are outfitted to resemble rooms in a home: bedrooms, kitchens, laundry rooms, etc. On a shelf are dozens of suitcases such as you might see at an airport. There are ramps where dogs learn to climb and jump, large tubes where they learn to crawl through tight spaces, counters that resemble conveyor belts. What at first glance looks like a storage area for odds and ends, upon closer inspection reveals itself as a carefully thought out “school site” for a canine curriculum. Peter Osowiecki grew up in Suffield and attended school here. At the age of 14 his grandmother signed him up for a special program designed to introduce youth to law enforcement career options. He stayed with the Suffield police force for 34 years. Because of various injuries received on the job, he began to find himself relegated more and more often to desk jobs; he could no longer take part in the active part of policing which he most enjoyed. He knows he will miss the interaction with colleagues and townspeople, but he looks forward to devoting more time to his family, both immediate and extended. Despite the difficulties of police work, Officer Osowiecki has no regrets. It was a good career, one which provided opportunities to serve others and to make a difference in important ways. Now he is moving on to the next phase of his life, leaving one commitment and pursuing another. Peter Osowiecki is a lucky man; to quote a much-used phrase, in his so-called retirement he is following his bliss!